Indian Union Minister for External Affairs Sushma Swaraj told parliament on Wednesday that talks with Pakistan are the only way to deal with terrorism; whereas New Delhi was engaging with Islamabad with a belief that dialogue was the only option to remove “the shadow of terror”. The Indian Minister visited Pakistan last week; while the authorities and diplomats were very hopeful for the successful dialogues. Indian media reported that she said to the Lower House, Swaraj said India and Pakistan decided to hold talks on terror when Prime Ministers Narendra Modi and Nawaz Sharif met in Ufa (Russia) in July and then in Paris recently. “We said we can talk so that terrorism comes to an end. So talks (between NSAs) took place in Bangkok where we discussed terrorism. But one meeting will not bring a solution to all problems. So, we will continue the dialogue,” she said during the Question Hour. 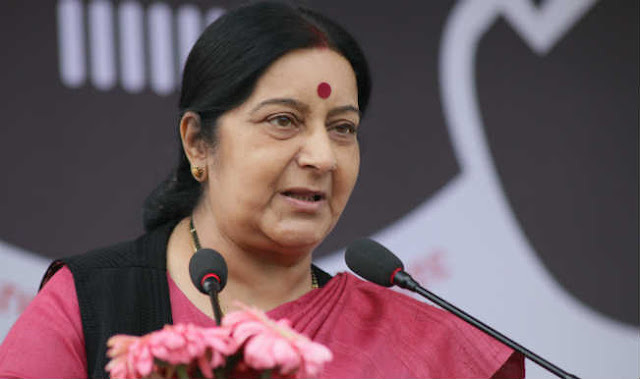 Swaraj further stressed that war with Pakistan was not an option and that India was talking to Pakistan regarding terrorist camps existing in Azad Kashmir. She was responding to BJP member Ganesh Singh’s question whether India was exploring options like the US did to hunt down terrorists like Osama Bin Laden. “We have decided that through talks we will resolve the issue of terrorism as talks are the way forward so that the shadow of terror is removed. But we want to make it clear…our prime minister has made it clear that talks and terror can’t go together. Dialogue is drowned by the sound of explosion,” she said. Swaraj’s comments came in the backdrop of India’s recent decision to restart the ‘comprehensive’ dialogue with Pakistan under which various subjects, including terrorism and Jammu and Kashmir, will be discussed. She said India will continue to take all necessary steps to safeguard the nation’s security and safety of all citizens. Asked whether India raised the issue of cross-border terrorism at any international forum like the UN, Swaraj said the government actively discusses it in all its forms and manifestations in multilateral forum including UN, EU, SCO, ARF, BIMSTEC, SAARC, GCTF etc. and bilaterally with several countries, including all P-5 countries in Joint Working Groups on counter-terrorism. “They held candid and constructive discussions. During my recent visit to Pakistan on December 8-9, the two sides decided that the NSAs will continue to address all issues connected to terrorism. The Indian side was assured of the steps being taken to expedite the early conclusion of the Mumbai trial,” she added. It is evident from history that no war did any good to anyone. Sushma Swaraj’s speech depicted that if we get any good mediator then many issues between Indian and Pakistan can be resolved.